I recognise parenting comes with certain sacrifices. There is much we will do for the sake of our children. 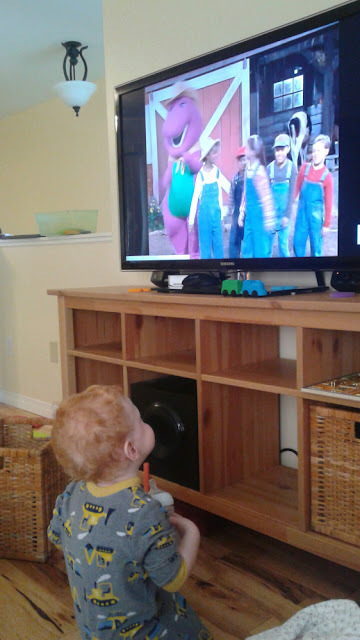 But I had resolved to make it through parenthood without being subjected to Barney & Friends. I'm sure I expressed this ambition to my husband at some point. Apparently, he forgot. Yesterday, I found father and son watching the dreaded Barney. I told myself not to panic. Maybe we can keep it a father-son thing. This morning breakfast was barely over and Kiddo was pointing to the TV, "Diasaur? Diasaur?" "You mean, Dinosaur Train?" Slight desperation in my voice. "No tain. Purple diasaur? Yes, diasaur, yes." Kiddo has also decided his farts are hilarious, and has learned he can replicate the noise, quite convincingly, by blowing raspberries on the leather couch cushions. Fabulous.